Baldwinsville, NY -- VIZIONefx, a Digital Network integrator based in Baldwinsville, NY, today announced it has partnered with SUNY Oneonta Athletics to provide elite visual communication tools within its department. SUNY Oneonta becomes the first of the SUNY schools to partner with VIZIONefx. VIZIONefx recently installed its CAMPUSefx Broadcast Channel and VZN Touch, an interactive touch screen solution, within Oneonta's Alumni Field House, home of Oneonta Athletics and a highly-used facility for the campus community. "VIZIONefx has added another place for us to display content using various forms of media. In just a short period of time, we have been able to load videos, photos and display information in one spot for our campus community, as well as visitors to our campus," said Geoff Hassard, Asst. Director of Athletics. "VIZIONefx worked with us to formulate a plan that would work best for us to reach our anticipated goals. With these products, you really have the ability to test the limits of what you want to convey to your audience." CAMPUSefx is a broadcast channel designed to distribute media content to television displays. In utilizing CAMPUSefx, televisions and displays become information-delivery vehicles for content and messaging. VZN Touch creates a dynamic engagement kiosk to interact with student-athletes, alumni, fans and visitors. Utilizing a beautiful HD touch screen display, VZN Touch allows users to easily navigate a direct portal to video clips, schedules, events, highlights, seating charts, wayfinding and historical information. 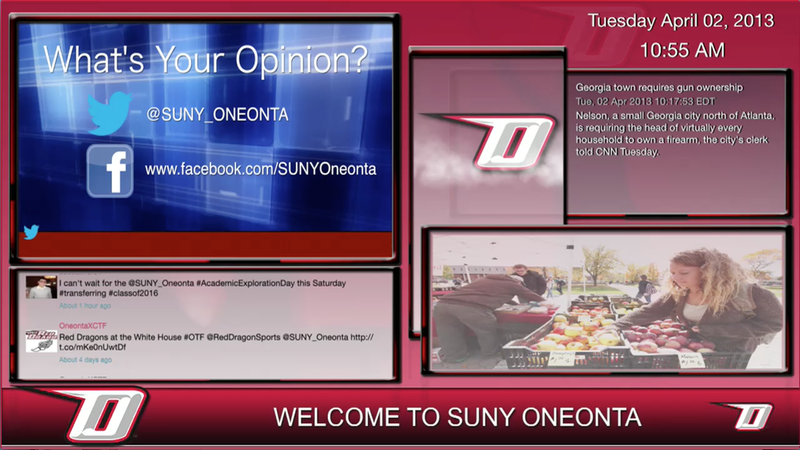 "We are proud to work with SUNY Oneonta Athletics, to develop these fantastic communication tools," said J.C. Whipple of VIZIONefx. "CAMPUSefx and VZN Touch will provide resources to expand and enhance efforts to engage members of the campus community, including students, staff, alumni and visitors." As part of the project, RJ Millworkers in Oneonta, NY, developed a custom-made kiosk to house the installations. One side features a 42" touch screen displaying VZN Touch, and the other has a 42" flat-panel display for the CAMPUSefx Broadcast Channel. VIZIONefx develops a broad scope of Digital Communication, Interactive and Advertising platforms and has installations with a variety of clients in Higher Education, Entertainment, Healthcare and Senior Living. Its client list is highlighted by Syracuse University Athletics, Washington Street Partners Development, the Carrier Dome, Le Moyne College, Hobart-William Smith Colleges, Oneida County Office for Aging, Madison County Office for Aging and YMCA of the Greater Tri-Valley. Occasional updates on our progress, plans, installs, and our exciting partnerships.